Four of our Solid Copper “Barn Light” Model W 101 ( custom size approx. 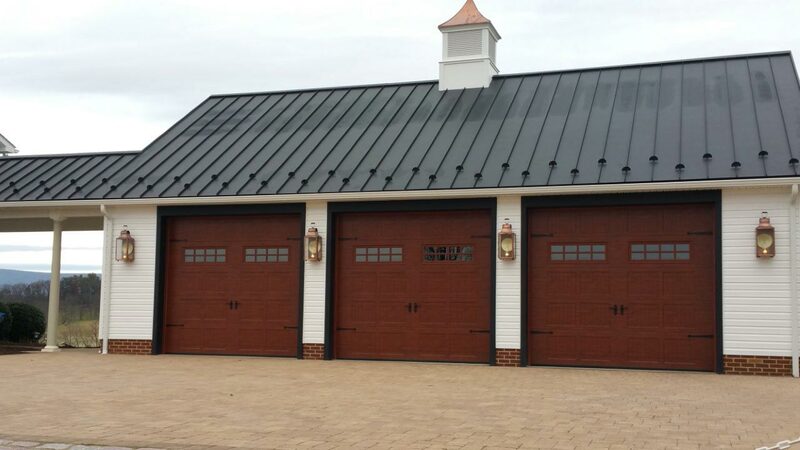 25″ Hx 10″ W x 8″ D ) create a lasting impression on this rural Virginia carriage house/ garage. First & foremost Hammerworks is the premier source for a Copper Colonial Wall Light Barn Lantern W101. 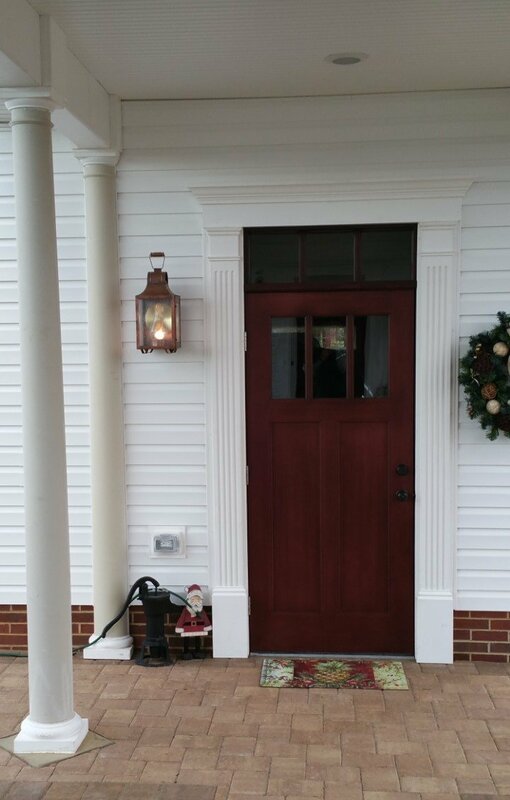 These distinctive fixtures are also available in a larger size, the Colonial Reproduction Home Lights Barn Lantern W102. Whether you are considering the large or small, you will be delighted with the classic yet rustic look of these Reproduction Wall Lanterns. 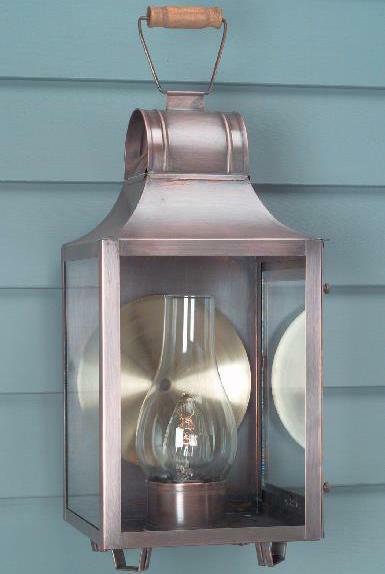 Not only that, we make each New England Wall Lantern using only solid copper or brass. Thus our classic Colonial Wall Lanterns will last for years to come. In addition you can choose from a variety of finish selections for your Colonial Outdoor Wall Light. In addition to our standard antique copper or brass finish, we offer verdigris copper or painted black. Our process employs attention to detail and historical accuracy reminiscent of the pride taken by Colonial craftsmen. We fold, bend, cut and solder completely by hand to produce a quality lighting fixture. The hand rubbed antique copper and brass finish gives the light fixture an attractive satin patina. Of course it will oxidize naturally over time. 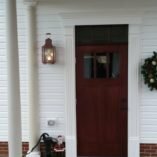 Thus due to the quality and accuracy of our Colonial outdoor lights, they are often chosen for municipal and Historic Restoration Projects throughout the U.S.
First of all we offer a wide range of period Colonial Post Lantern styles. We offer styles from Primitive to Traditional as well as Arts & Crafts Lighting and an impressive collection of Olde English Tudor lighting. Thus no matter the architectural style of your home you will find the right post lighting choice at Hammerworks. Most importantly when you decide on size and quantity of handcrafted Colonial Post Lanterns, keep in mind the following factors. Consider size; it is important to choose a light that does not appear undersized in relation to the setting. Therefore the distance from the Post Lantern to the building, as well as the building size itself determines appropriate lantern size. 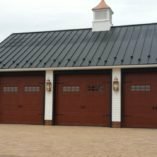 Hence on a long driveway, multiple copper or brass post lanterns may be necessary, to achieve proper illumination as well as aesthetic value.